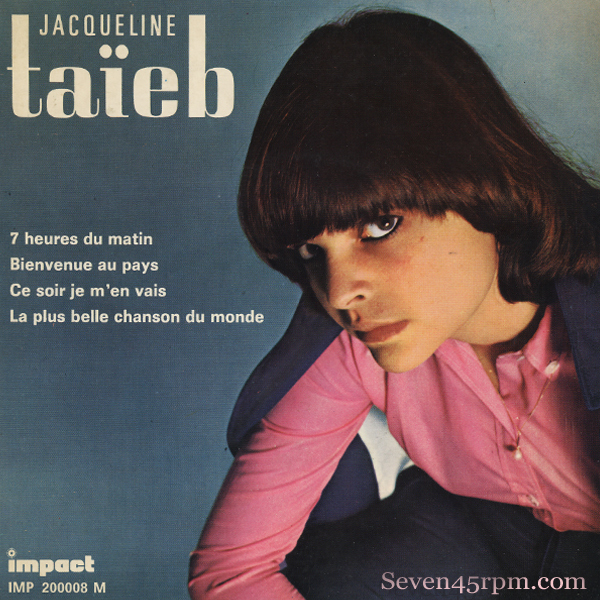 Track 1 – 7 heures du matin https://seven45rpm.files.wordpress.com/2013/12/s45-jacquelinetaieb-7am.mp3 Track 2 – Ce Soir Je M’en Vaishttps://seven45rpm.files.wordpress.com/2013/12/s45-jacquelinetaieb-cesoirjemenvais.mp3Born 1948 in Carthage, Tunisia, the young Taïeb arrived in France with her parents at age eight. Her father gifted her with a guitar at 12 (like every good dad should do) which she must have really connected with, because soon she would be composing her own songs. It wasn’t long before a talent scout would discover her while singing with friends. It was ’66, and what an exciting time it must have been for the perky 18 year old singer-songwriter, scoring a contract with the record label Impact, and then being quickly whisked away off to London for her first recording sessions. 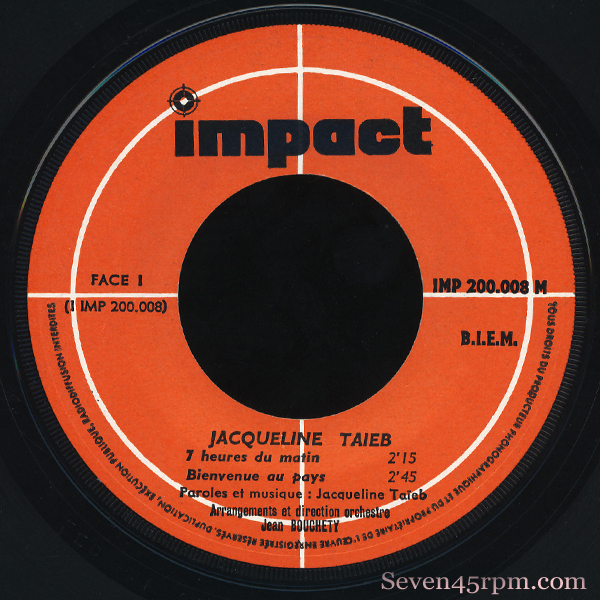 1967 saw a string of 7″ releases for the now 19 year old Jacqueline, but it’s this debut EP release (in January) that she is most well worshiped for. All four songs on the EP were composed by the young singer herself, which you have to remember for that time, was quite rare, as most female singers were expected to perform songs that had been written for them, or perhaps covers of other popular high selling hits. Though the lead track, the almighty ye ye classic 7 heures du matin, was only a small hit at the time, it has gone on to become considered a classic of the French girl pop genre. It is the story of a young student waking up too early, at 7am, on a Monday morning, struggling with the thoughts of what the day will throw at her. She fantasizes about her boy crush Paul McCartney, helping her complete her homework, while tormenting on which sweater to wear for the day. Obviously a girl who is after trouble, the rebellious girl even considers playing her Elvis record loudly just to upset the neighbors. I mean really…how cute is that!? It’s a simple song, but a huge dance floor monster! With it’s Steppin’ Stone garage power chords and it’s rebellious Elvis meets The Who attitude, it’s freakin’ impossible no to adore this one! And obviously very high in demand in the collectors circle. This track really brings back some great memories of the Sounds Of Seduction nights we once were fortunate to encounter here in Sydney in the 90’s, hosted by the great Jay Katz, (a friend who is responsible for introducing me to so much great lost European dance and film music of the sixties). And this song was also the trigger to the beginnings of my Yeye obsession! As I’m researching this fabulous piece of R&B dance floor femme gem, I quickly discover that there is actually a lot of conflicting and confusing information (again!) out there, regarding this 5 pc. 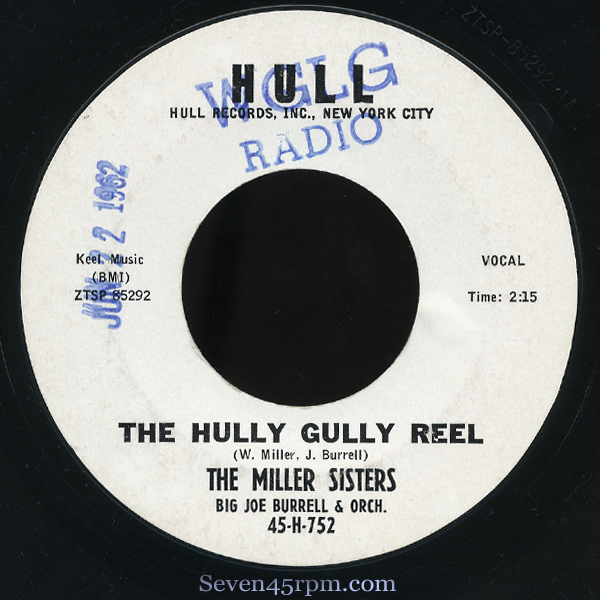 Miller Sisters vocal group and Sun’s Rockabilly sibling partnership that were around at a similar time, with the same name. Two completely different groups yet both so brilliant. I will be posting on the Elsie Jo and Mildred Miller sisters soon I promise! 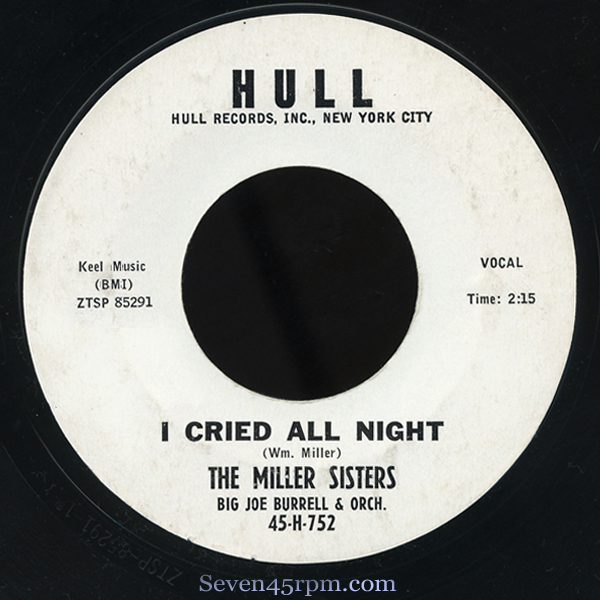 The Miller Sisters (from Long Island, NY) are Jeanette, Maxine, Nina, Sandy and Vernel, and were the talented daughters of music entrepreneur William Miller, A&R director for Hull Records. They first recorded Hippity Ha with the adorable flip Until You’re Mine for Herald back in 1955, the same year they also scored a starring role in Fritz Pollar’s R&B picture Rockin’ the Blues, which also included the Harptones, Hurricanes, Wanderers and the great Lula Reed. In ’56, after releasing Guess Who / How Am I To Know on Ember, they moved to Hull Records, which was the label former Herald Records executive Blanche (Bea) Kaslin’s established along with Billy Dawn and Mr. Miller (apparently Kaslin had just had enough of seeing artists being mistreated, not paid appropriately, and being taken advantage of with contracts). The label had some great R&B success with their very first release from The Heartbeats Crazy For You / Rockin-‘n-Rollin-‘n-Rhythm-‘n-Blues-‘n in ’55. 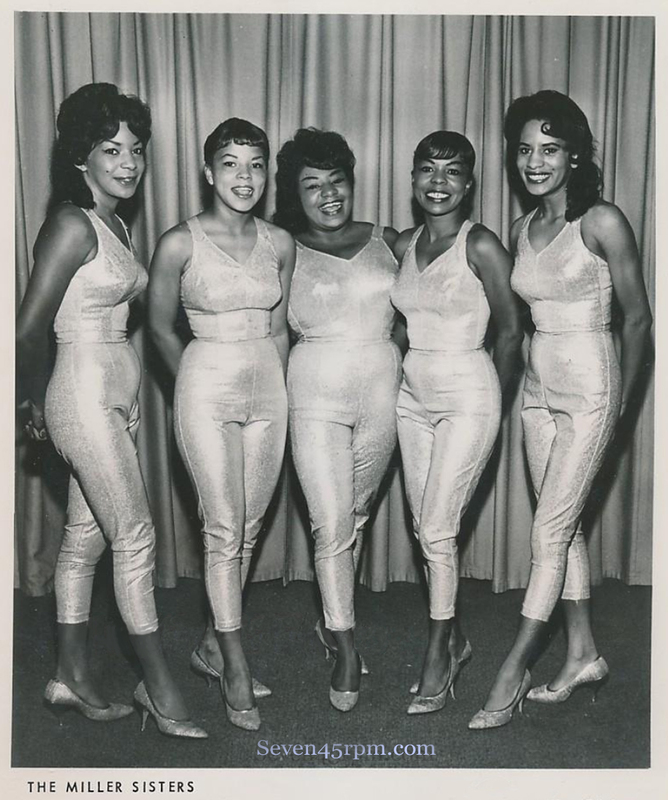 While the sisters were at Herald records, their father obtained their release from an exclusive contract that they held with the label and would thereafter freelance for Hull, ACME, Onyx, Riverside, Roulette, Capri and others. Moving forward to ’61, and it was hully gully fever that was scuffing the dance floors, and the Glodis release Pop Your Finger (flip to You Got To Reap What You Sow) certainly would have been getting some heavy rotations around the dance halls. 1962 brought some crackers for the girls, firstly Rayna’s superb release Dance Little Sister (flipped with I Miss You So), and this is the stuff that just thrills me. Slow and swinging, but heavy on the rhythm, and brutally charming vocals with more sass than one can handle. Then on Riverside, the dizzyingly beautiful ballad Tell Him (flipped with Dance Close). But the year also brought out this beast…The Hully Gully Reel! It’s a mass of rhythm delivered by a thundering steam train. A good one to drop when the dance floor is all warmed up and salivating. Feels very Eddie Bo…it’s got that empowering rhythm, but it’s the legendary Big Joe Burrell with his big Sax driving the orchestration with full pelt. Burrell would work with the Sisters on tour and other recordings for a big part of their career, and it’s obvious a match made in heaven. If 2.15 minutes of non stop frantic hully gullying rocks your boat, then you’re getting you money’s worth here on this 45! Not for the faint hearted! And by the way, how good is that electric organ?! It’s on fire! 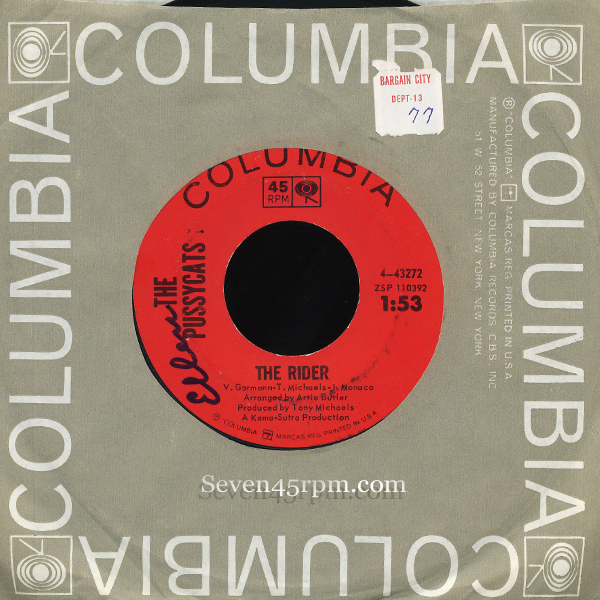 In ’64, Big Joe and the ladies struck again with Cooncha – Hey You which they recorded in Quebec for Capri in ’64, supposedly while on tour together…driving stuff! (Their father was credited as “Pop Miller” on the label). The Sisters weren’t done though as far as killer 45’s go. A much more soulful I’m Telling It Like It Is on GMC from ’65 is also very desirable! 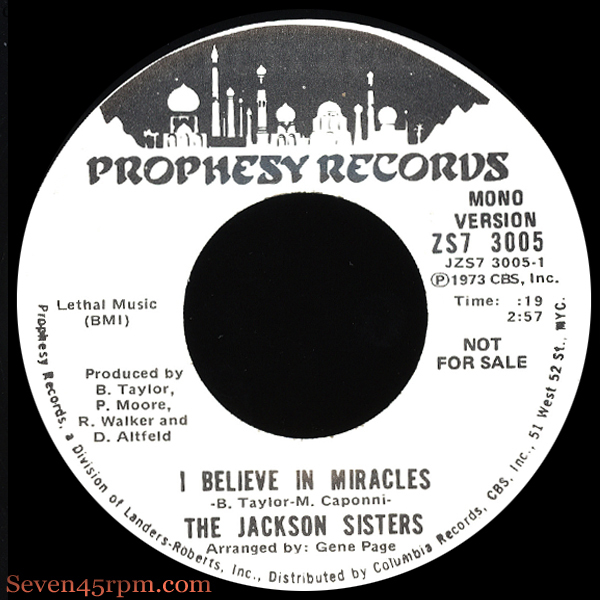 The Miller Sisters recorded around 22 singles for various labels, and as is the case with this one, some are not easy to find. I feel very fortunate to have my hands on this one, and have made an oath to share it on as many dance floors as I can! The Stovall Sisters may have come from a strong gospel upbringing, but this thumpin’ delivery is a hymn praising winged angels with halos of fiery funk! Born in Kentucky and raised in Indianapolis, Indiana, sisters Nettie, Lillian, and Rejoyce, were three of ten children of James and Della Stovall. Their mother was keen to lay down a musical path for her children, by kick-starting their singing voices from around the age of two, and as they grew up, they would tour the roads of the Midwest and South with the family gospel groups. The first family group was known as the Four Loving Sisters (the name was later changed to the Valley Wonders) and consisted of the four eldest sisters, Billie, Dorothy, Frances, and Georgia. 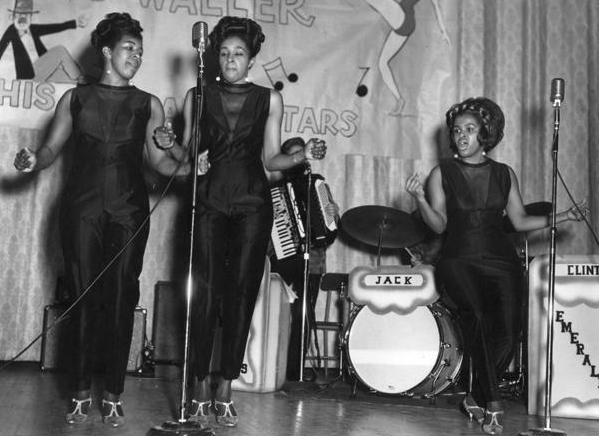 Prior to joining the Valley Wonders, Wayne, Nettie, Lillian, and Joyce performed in a separate family act known as God’s Little Wonders for as long as their childhood held out. When they grew too big to persist as ‘Little Wonders they inherited the mantle of the Valley Wonders from the four older sisters whose careers had succumbed to marriages. Della managed and negotiated recording contracts for them, who also recorded as The Stovall Family (accompanied by two brothers). In 1964 the family moved to Oakland where the already seasoned performers finished high school and began worrying about economic survival. 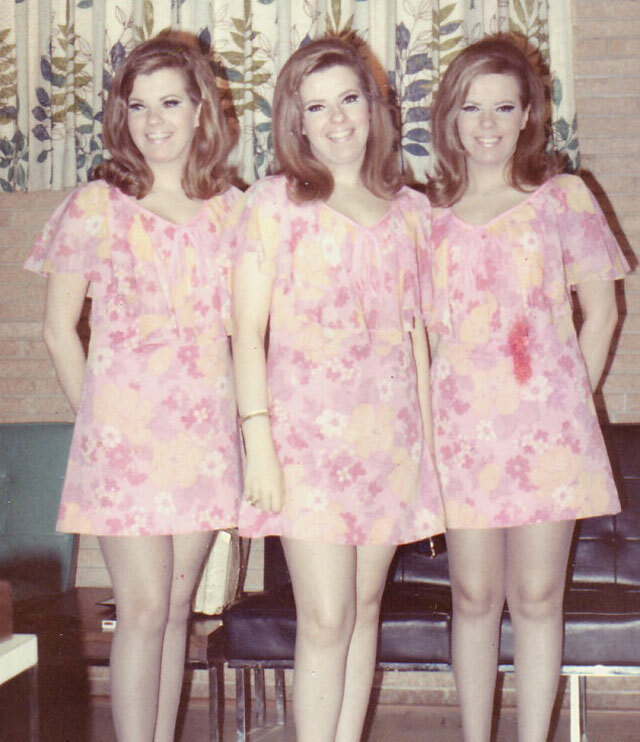 They continued to sing in church but the Stovall sisters had to support themselves with weekday jobs. During this period they broadened their repertoire to include rock ‘n’ roll and rhythm and blues which gained them entrance to Oakland area night clubs, sometimes under the name of Sister Three. 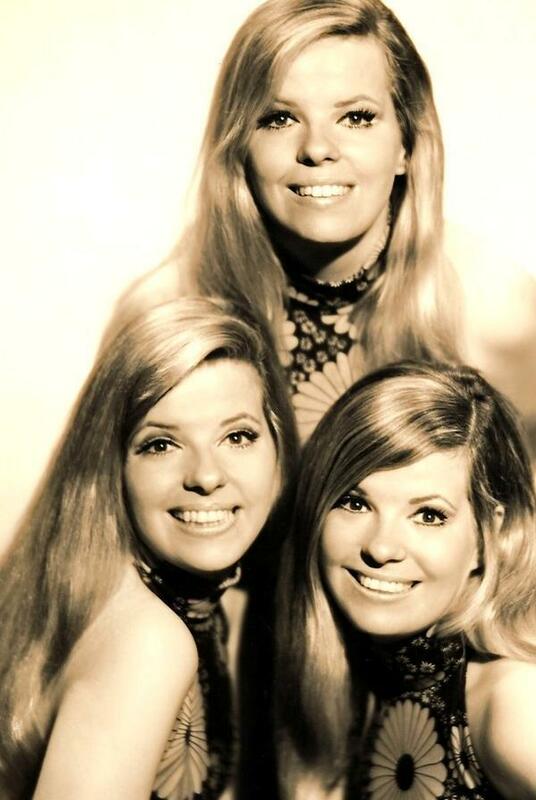 In 1968 the three girls decided to go for it, a full time professional rock n’ roll career. Their initial step in this direction was naive but direct. According to Lillian “We put an ad in the Oakland Tribune – Three black girls looking for a Caucasian band to sing with”. The only serious response was from a man named William Tuckway. “He came right in and sat on the floor like we’d be knowing him for years”. Tuckway would soon co-produced their debut album on Reprise along with Erik Jacobsen. 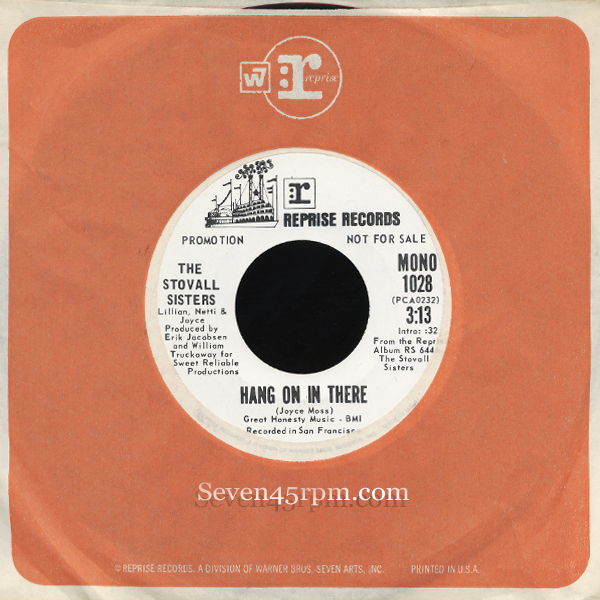 Hang On In There is the funk standout on their sole Warner/Reprise gospel/R&B crossover album and I’m so damn thankful that it was issued on a beautiful and loud 45. It looks like it was only released as a promo two same-sided track, in mono and stereo. It’s a big groove song…and a wildly uptempo-ed journey! The band is hot, tight and super sharp…going from album credits-Bass: Doug Killmer, Drums: Bill Meeker, Guitar: Dennis Geyer and on Horns: Ron Stallings, John Wilmeth, Hart McNee, David Ginsburg and Neil Kantor. Too good not to share and deserves far more attention than it gets! The three sisters maintained a successful career as studio professionals and touring backup singers for an impressive list of well-known artists that include The Staple Singers, Bobby Womack, Ray Charles & The Blind Boys, BB King, Big Mama Thornton, Etta James, Jackie Wilson, Joe Tex, Parliament-Funkadelic and briefly performed as the Ikettes with Ike & Tina Turner, 1967. 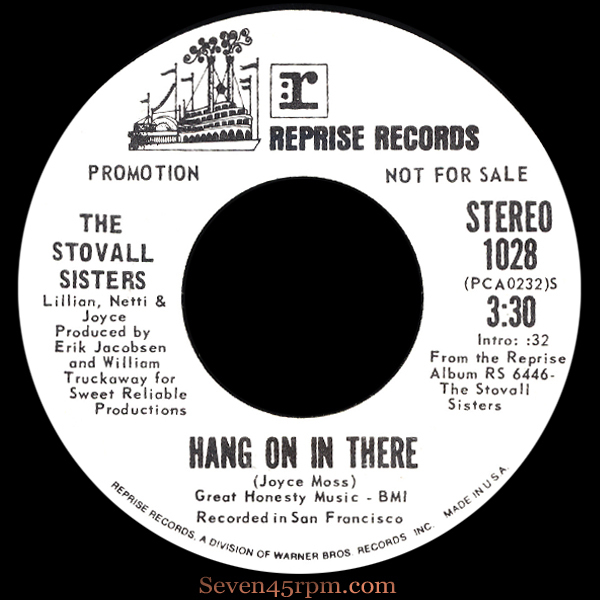 The Stovall Sisters would go on to record unreleased tracks for an album with Earth, Wind & Fire’s Philip Bailey and Maurice White but would disband before its release. The Stovall Sisters currently reside in Oakland, Calif. So my first of what will be without a doubt, many Eddie Bo and related posts, is this fab piece of New Orleans lady funk mastered by the genius himself. As a lot of Bo’s ventures go, it’s difficult to find specifics and particulars with so many scattered productions, and while I can’t tell you much about the Explosions in detail, what has come to light is that it was a teenage Juanita Brooks singing up front on Hip Drop! Bo, who is responsible for such beastly funk jams as Hook and Sling, Pass the Hatchet and the irresistible Every Dog Got His Day, to name but only a very few, produced, wrote and released this gem on his own label Gold Cup in 1970. That same year he also released Check your Bucket on another imprint Bo Sound, and wasn’t a stranger to “going it alone” for publishing and producing by that time. There were only two other releases on Gold Cup, which happen to be the only other three recordings that Explosions ever released, the elusive Jockey Ride and Garden of Four Trees flipped with Teach Me. 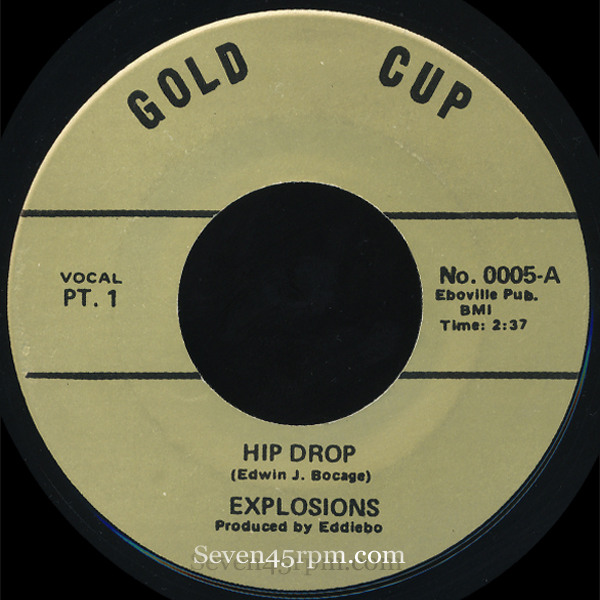 Brooks was in fact mis-credited on the latter label when it was actually Marilyn Barbarin who sung up front on Four Trees, although apparently she was never an actual member of the Explosions. Obviously she is freakin’ amazing on that track! Hip Drop is so damn funky and really should come with a booty shaking warning! And to make things even better, it’s a “2 parter”, so you get to come back for seconds. It’s perfectly raw as you’d expect from these great early 70’s Bo recordings, and cooks up with just the right amount of fat, dirt and “sassytude” (see what I did there…clever huh)! Juanita Brooks, who came from a musical family, was also a great gospel and jazz singer and later performed for many years in stage and theater in New Orleans and off Broadway. Sadly she passed away at the age of 55 in September 2009. Eddie Bo died 6 months earlier on March 18, of a heart attack. But let us rejoice for this fist full of funk they both hit us hard with all those years ago which still gives the floor a good beatin’. And every time I drop it, I can always expect to get at least one punter asking “what the hell was that”! 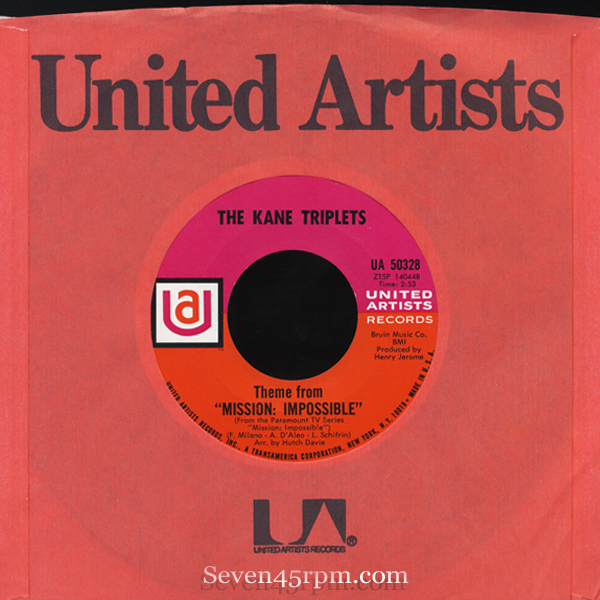 The ladies released a few 45’s but it was in 1968 when this little monster was unleashed to the world! Easily their most stin ging and thrilling recording, which really does give justice to Lalo Schifrin’s original 66′ master piece. While writing credits go to Fred Milano and Angelo D’Aleo of The Belmonts, I can’t tell you if this was in fact the first vocal release, but it’s by far the best I’ve heard. The fact that these now adorably blossomed but still innocent looking ladies are behind this big composition and production makes it even more tastier! 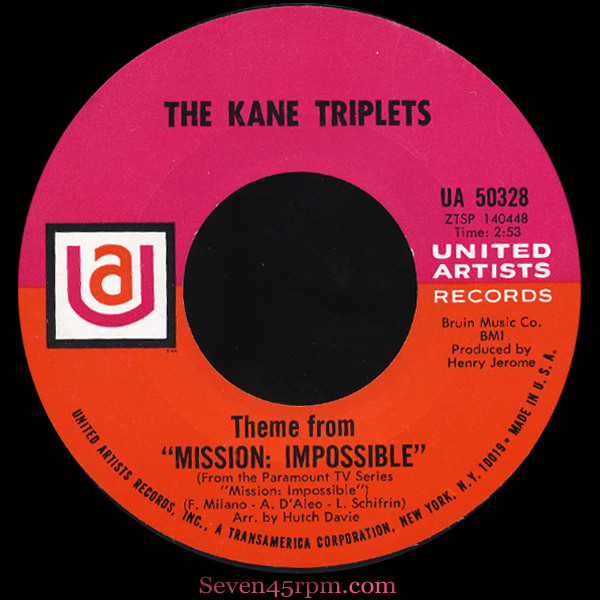 The Kane Triplets were in show business for more than 20 years and made dozens of television appearances, but sadly another sad ending to this story learning that Jeanne Kane was found murdered at a Staten Island (New York City) commuter rail station parking lot, murdered by her ex-husband and retired sergeant John Galtieri in 2007. But on a nicer note, this song always get a great reaction on the dance floor when played and will keep these three little sisters shining on together for many more years. 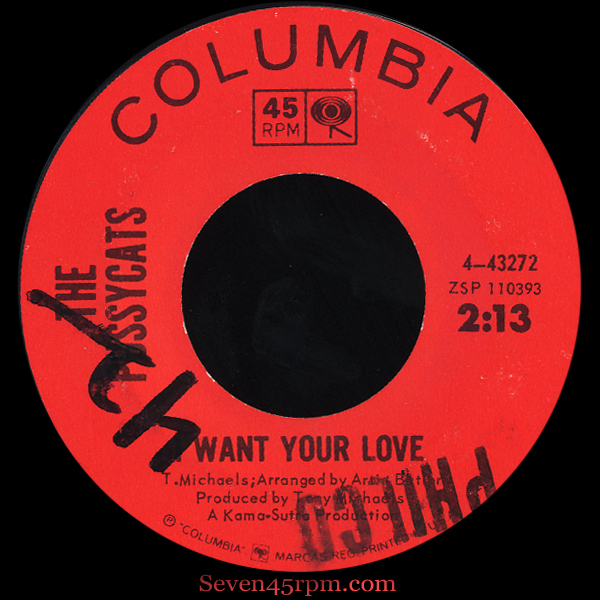 Track 1 – I Want Your Love https://seven45rpm.files.wordpress.com/2013/12/s45-thepussycats_love.mp3 Track 2 – The Rider https://seven45rpm.files.wordpress.com/2013/12/s45-thepussycats_rider.mp3 One of my top tens here and it just kills me that I cannot find out any real information on these gals and this killer garage recording! It’s looking like this mighty 4 piece girl group may have only ever laid down 4 studio tracks in their career, including this release with The Rider on the flip, and also You Can’t Stop Loving Me (Columbia 4-43587), which I’m guessing was released that same year. Strange that you also get a very delightful Dressed In Black on that flip, made popular by The Shangrilas in ’66 on Red Bird. I Want Your Love, written by Tony Michaels, has all you could possibly want in my opinion. Opening with a dangerous blues riffing companionship with overdrive guitar and bar piano, insert seductive vocal “Hey you…. come here” and before you know it, you’re in the widow’s web. The first verse is playful and desperate, and the backing doo-wops and harmonies are starting to spin you in a spiral. We are now only 30 seconds in and the guitar gets dirtier and the build up, like a steep roller coaster climb, is making you nervous. You’re pretty much trapped by now, and can’t help feeling like that little mouse that kitty just won’t let die…all in the name of selfish pleasure perhaps. This track ticks all the boxes for me! It’s raw and driving, like good garage should be. It’s got great horns and pace, stomping percussion and stinging guitar, and of course those femme fatale vocals….innocent yet sultry, and even soulful! Great production from Michaels and killer arrangement by Artie Butler! The Rider is more down tempo but still just as charming and has more of that Spector sound that I can’t get enough of! 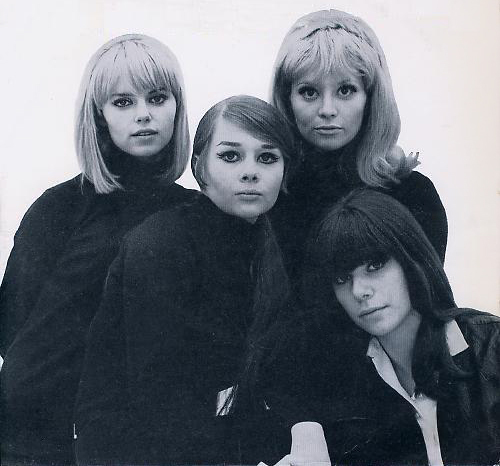 All 4 Pussycats recordings also came out as an EP (Portugal) through CBS in ’66 with a killer pic sleeve (above) of all 4 band members. As always, I would love to know more about these elusive ladies and their recordings. 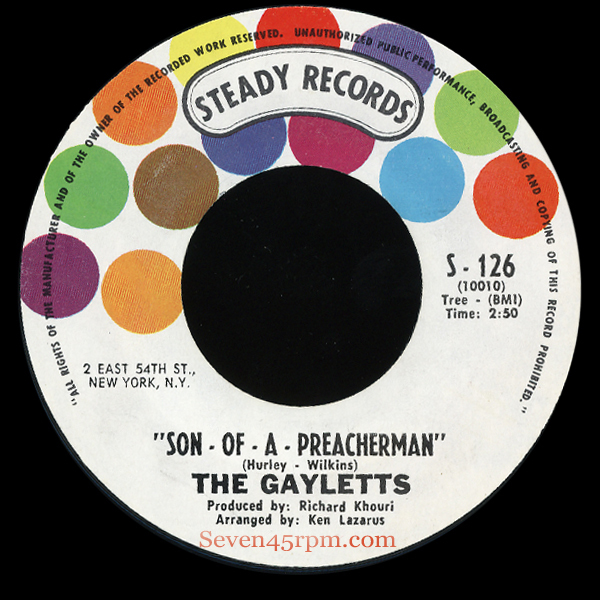 The Gayletts formed in 1967 in Jamaica consisting of Merle Clemonson, Beryl Lawson and the legendary Judy Mowatt, but sadly broke up in 1970 when Lawson and Clemonson left for America. 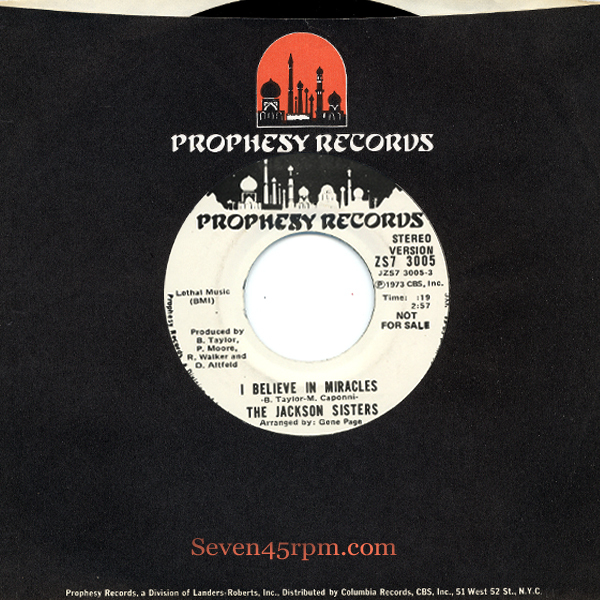 While it’s difficult to tell you much more about this lovely short lived reggae soul formation, they did leave us a handful of 7″s including this smashing Dusty tune, Son of a Preacher Man, the adorable Silent River Runs Deep, and another great cover, Brenda Lee’s Here Comes That Feeling. Judy Mowatt of course did go on to become quite the prominent reggae queen there after. In the earlier 70’s she wrote tracks for Wailers’ front man Bunny Livingston, but got her big break in ’74 when she joined up with Bob Marley & The Wailers’ backing vocal trio the I Threes, along with Rita Marley and Marcia Griffiths. Mowatt continued to record for decades after, including a spree of gospel albums between 1998-02. 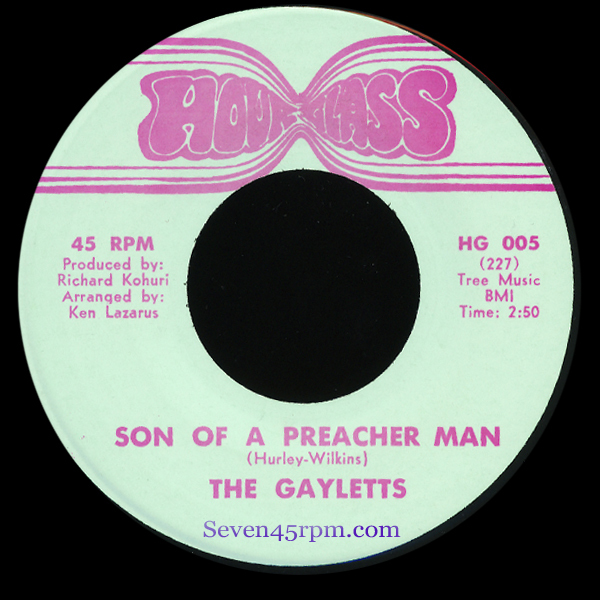 Preacher was arranged by Ken Lazurus, who once sang for Byron Lee And The Dragonaires, and was released on Steady Records and also on Hourglass the same year . The flip That’s How Strong My Love Is, is a very loving slow ballad with 2.37 mins. of the sweetest harmonies. The Gayletts is that perfect explosion you get when you mix up a nice dash of doo wop, a big clump of rock steady and a generous sprinkle of heart and soul, and then stirred with the most beautiful rhythm. I find this track so uplifting and a hard one to beat when it comes to female soul groups!